'Generation Etch' laser etching by J.H. Wagner & Sons. Design, carving and decoration have always held a place in the supply of monumental products and now J.H. Wagner & Sons offers the amazing art of Laser Etching to permit memorialisation to become more detailed, personalised and unique. 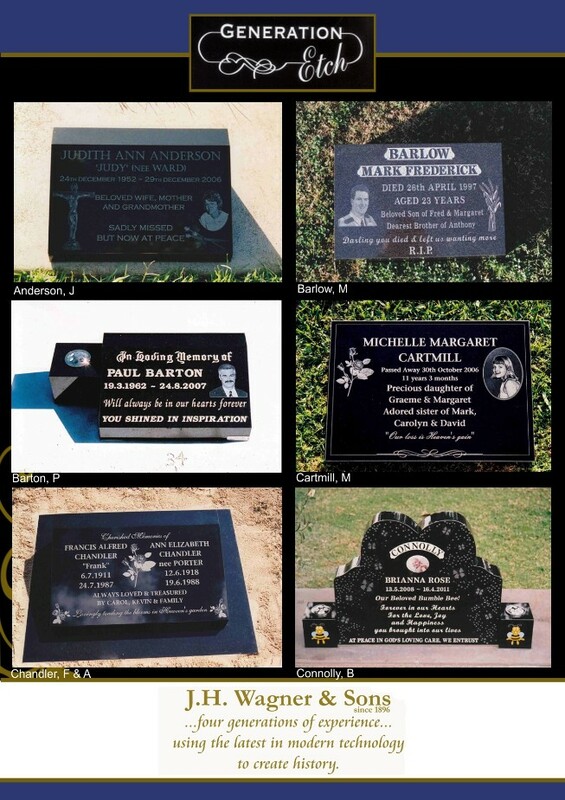 Combining Black granite and images etched using Laser technology the possibilities for a Laser Etched image start at a 90mm diameter disc portrait and extend to include headstones and large form Public Memorial applications. Art and technology have successfully combined to offer the ancient skill of etching with the convenience of laser application. Etching relies on the creation of a visual contrast between the area which has been etched and the original surface finish of the material. To capture this contrast effectively, at J.H. Wagner & sons we use polished Black granite as our base material and carefully etch the image into the stone, thus the contrast is achieved from the polished surface to the etched surface. Laser Etching permits photographs, images and text to be carefully positioned with computer before proceeding to the intricate work of laser application. Laser Etching is permanent, it will not wear off, nor fade. Fine detail can be achieved for emblems and portraits and etchings can be created with landscape backgrounds, photo collages and laser text. While the Laser Etching product is perfect for memorial use the possibility of use in other applications is extensive. Why not consider an historical marker, entrance statements and gift portraits? If you have a use that is not mentioned, please discuss the possibilities with the staff of J.H. Wagner & Sons.